Character: Dr. Slump: Arale-chan, Dr. Slump: Hoyoyo! Arale no Himitsu Dai Koukai dayo!! Ah, Dragonball. The beginning of one of the longest and arguably most popular anime franchise on both sides of the pacific. Unfortunately, this anime seems to be shunned by a few based on its affiliation with its sequels. That's a shame, really. One huge reason why this anime holds its own is that the entire franchise is in its infancy. There are no Super Saiya-jin stages to worry about, and the fights aren&rsquo;t stretched out to their barely tolerable limits. The various quests that the young Z-Senshi embark on are just that: quests. There are no interstellar enemies to fight (early on), and the majority of the time spent is on the team simply trying to find the dragonballs. The comedic element in Dragonball shines just as brightly and flows smoothly with the story. The characters have such a genuinely portrayed chemisty between each other. Dragonball never seems to take itself too seriously, allowing the viewer to sit back and enjoy the ride. For a twenty-year-old series, Dragonball looks the part. Time has taken its toll, as the art and animation haven&rsquo;t aged very well, though by 1980's standards, it's pretty good. On the other hand, the fights are better planned out, particularly during the Tenkaichi Budokai. Instead of the &ldquo;beat-down-to-the-brink-of-death-only-to-tap-in-to-a-hidden-power-and-win-at-the-last-second&rdquo; routine, combatants actually have flaws and human weaknesses, including Goku. Some are actually enjoyable with comedic moments placed within them. As the series begins its final arc, however, we begin to sees shades of the future for this franchise. Fights begin to grow longer and longer and the comedy slowly begins to wane. Like I said earlier, it&rsquo;s a real shame that this series gets such a bad reputation because of its successors. Sure, it eventually parts into its lackluster sequels, but as the saying goes, &lsquo;Don&rsquo;t judge a book by its cover.&rsquo; Dragonball is a fun series that should be worth anyone&rsquo;s time, be you a newcomer or a seasoned veteran. This won’t be an in depth review because everyone knows about Dragon Ball and its influence and there are already numerous reviews written about it. This will just give you an idea of whether you should watch it or not, for those who haven’t yet. Dragon Ball undeservedly doesn’t receive the same attention as its more popular sequel. The Dragon Ball series does receive a lot of flack for being really repetitive and for its unnecessarily long fight sequences but it’s really unfair to compare the franchise to what the shonen genre has become today. Because of this people tend to overlook Dragon Ball. Dragon Ball is divided into multiple story arcs, some longer than others, which are hilariously funny and manage to entertain with fantastic battles. Dragon Ball is gut bustingly hilarious, and it might surprise people how sexual the jokes are and how comfortable Goku is naked but the gags never got stale. The fights were always entertaining and well thought out. It was never just a case of running in, attacking and (if a foe was just too great) tapping into a hidden power. Although the first two thirds of the show are quite funny, the tone grows a lot more serious starting with the last third, a lot like the tone throughout Dragon Ball Z.
Goku might come off as one dimensional since he was one of the first traditional shonen hero archetypes, but the more you watch the show, you’ll realise he isn’t just some stupid and strong fighter. The rest of the cast move the plot along pretty well with some of them playing major roles, which is a shame really because in the sequels they basically serve no meaningful purpose, not in the story or with the fighting. The animation is dated, but one does get used to it rather quickly. Sometimes the same animated shots are reused but this doesn’t detract from the enjoyment. Characters designs are also exaggerated for comedic slapstick purposes that manage to gain quite a few chuckles. I saw the dubbed version and all the voice actors fit their roles well, especially Barbara Goodson as Goku and Mike McFarland as Master Roshi. The English OP was really catchy (some may disagree) but the ED was forgettable. The Japanese songs scattered throughout the series were not too shabby but were usually drowned out by the chatter of the characters. A classic that will forever be in the shadow of its sequel that manages to be fun from start to finish. Despite a few hiccups in the animation, Dragon Ball is truly a remarkable and fun show to watch. It’s long, but it never stops being entertaining. If for some unexplainable reason you have yet to watch the Dragon Ball franchise, this is the perfect place to start. Oddly enough not alot of people know of the anime that started it all. Yet most of them have probably watched the sequel. Why is this? I catch myself in this thought all the time, because the prequel is strikingly good when compared it to it's Z counterpart. This anime succeeds despite it's shortcomings in my book. This is simply because it know's it's a goofy fighting anime and thus dosen't try to be anything else. The focus is therefore put on fighting, cracking jokes and gags, and last but certainly not least: The journey that Goku goes on in itself. The story in here is very simple; finding the Dragonballs. At least that's what the gang spends a large bulk of the series doing. Due to the length of this series it's obvious that there will be fillers. However the fillers do more than just fill in the time where we aren't fed the canon story. The fillers generally retain the quality of the canon episodes, and there aren't that many of them either. his is largely due to the fact that the humour in Dragonball is fantastic and feels naturally woven in with all the characters and the story. This also applies to the fillers. Some viewers may criticize Dragonball for the reptitive nature of the story, saying that it's the exact same thing over and over again. And to a certain extent they're correct. But this leads back to what i was previously talking about; a "proper" story would do more bad than good here. It would leave less freedom to make this anime as goofy and hilarious as it is. And you shouldn't be watching a fighting shounen for the story. The characters in Dragonball are all lovable. No matter the size of their role in the story. They are all fleshed out over time and you will either love or hate them. Goku in particular is very fun to watch, because the majority of Dragonball viewers saw Z first, which may have left you wanting to see what Goku was like during his early years. He is truly a treat to watch, and is quite clearly the staple for all other shounen protagonists. The fights are the main driving points of this anime along with the comedy aspects. Thankfully they don't make the fights ludicrously long in an attempt to make them exciting. The pacing of the fights is well done the fights well thought out. Strategy plays an integral role in the majority of the fights earlier on the series, and as the series progresses it slowly reaches the point Z is at. The anime is old and you can easily tell by the art and the visuals. (hehe penises.) No, but seriously. The animation and art are average for their time, which means that it obivously pales in comparison to modern standards. But if you look at it through a more objective scope it has suprisingly aged quite well. Remaking this series with updated visuals would be mistake because I feel there is a charm in the old art style. The magic of the show would certainly go lost along with the old feel of it. Dragonball is an anime that cannot be missed. Do not let the length or the visuals of this anime discourage you. It's truly worth your time. Join Goku in his mystical adventure for the Dragonballs! 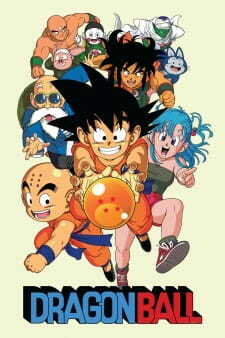 The Dragonball Series, is the first in a line of series. It is about the adventures of a young boy Goku, and his travels as he quests to find the 7 magic dragonballs, which can grant anywish! This series is both a comedy and a fighting anime. I enjoyed it quiet a bit and it even enjoys a home in my personal anime collection. At times the story can be pretty simple, or obvious, or completely random. But overall the general story and the progression through it are very good. Although it doesnt measure up to other animes as well, its own orginal story and characters keep your interested and coming back for more. A decent sound tract, the intro song I always fast forward through because it is annoying. But other then that the series has decent soundtracks within the series. Probly the main draw of this anime. The Characters are funny and orginal and have all kinds of quirks and flaws that makes you laugh. Alot of the characters are exteremly skilled in Martial arts and other techniques which gives the shows action sequences some major rewatchability and excietment. I loved this series it made me laugh, or at least chuckle, quiet a bit. A solid favorite of mine that i even went to the trouble of buying the commercial DVDs for the series. In fact writing this review has inspired me to crack it out and rewatch the series. If you enjoy silly humor, amazing martial arts fighting (which comes in later in the series the first several are very light on any actual fight sequences of any length.) But I love this series and Im pretty sure that you will too. So please give it a try.